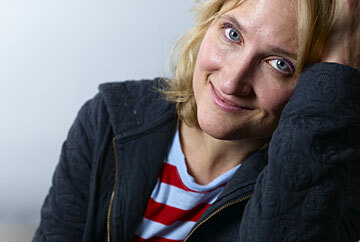 Jill Sobule belongs to a rare breed of artists. Her work is at once deeply personal and socially conscious, seriously funny and derisively tragic. Over five albums and a decade of recording, the Denver-born songwriter/guitarist/singer has tackled such topics as the death penalty, anorexia, shoplifting, reproduction, the French resistance movement, adolescence, and the Christian right. Did we mention love? Love found, love lost, love wished for and love taken away. While her songs cover a huge amount of ground, they all have benefit greatly from Jill’s subtle intelligence and skillful light-handedness. No sloganeering flag-and-fist waving here, but rather story songs about human beings, real and imagined, which allow us to step back from the issue, be it personal or social, and relate to it as we would a close friend. To see Jill live and in concert is a rare treat. It is on stage that she is most comfortable, most powerful, and where the delicacy and range of her work can be best appreciated. She entertains, amuses, provokes, and more often then not, takes her audiences on an emotional roller coaster, from comedy to pathos in a few bars of music. Jill began playing guitar when she joined the Junior High School band. She never learned to read music, though, and faked her way through rehearsals and performances by playing by ear. As she began writing songs, it was very clear to Jill this was becoming more than a teenage hobby. Music was serious stuff. She played in a variety of funk and rock bands in Colorado, and eventually made her first, Todd Rundgren-produced, album for MCA, Things Here Are Different. But success did not knock on her door until three years later, when Atlantic Records released her MTV staple and national top 20 hit I Kissed A Girl. “That song was a double-edged sword for me,” Jill Says. “It was perceived as a novelty hit, but on the other hand it was the first song with an overtly gay topic to be aired on Top 40 radio. I am quite proud of that.” The self-titled album also yielded another hit song, Supermodel, included in the Clueless soundtrack. The song also jumpstarted her live music career in a big way, and since then she’s had the honor to induct Neil Diamond in the Songwriter’s Hall of Fame, to share the stage with the likes of Neil Young (at his yearly Bridge School benefit concerts), fellow activists Billy Bragg & Steve Earle, and Waren Zevon.